Demolished - no evidence of the station remains. 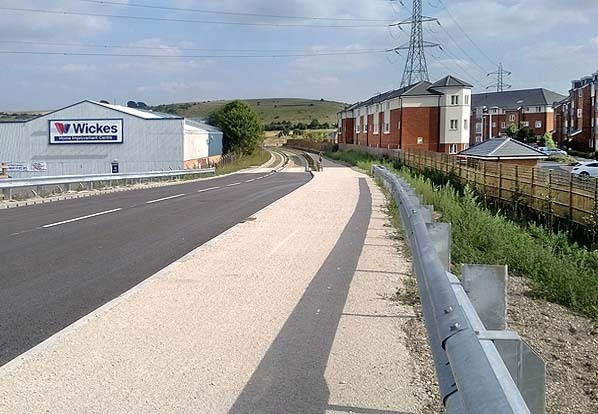 The track bed now forms part of the Luton - Dunstable busway. The station site has been redeveloped for housing and is called Station Court. Notes: Dunstable Church Street station opened with the first section of the Hatfield line between Dunstable and Luton on 3rd May 1858. As built, the station was a simple timber structure on an embankment south of Church Street.The original intention was for the Luton line to run across Watling Street to make an end-on connection with the LNWR's station at Dunstable. This would have involved raising the road by 3 feet to build a level crossing. This was turned down by Parliament. Instead a diversion was built taking the new line across Watling Street on a bridge, bypassing the LNWR's station. Initially through trains between Luton and Leighton were unable to call at Dunstable unless they reversed into the station. (opening in January 1866) but, before that, the GNR rebuilt Church Street in 1860 to coincide with the opening of the second stage of the Hatfield line, between Luton and Hatfield, on 1st September 1860. The station had a substantial three-storey building with an adjacent two-storey stationmaster's house. The building included stairs to take passengers from the ground floor booking office to the platform and waiting room high on the embankment. 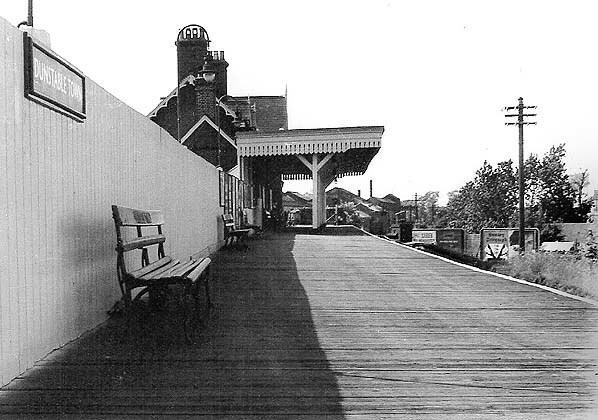 The platform was still constructed of timber and had a wide canopy projecting across the track. The goods yard consisted of four sidings at the level of the booking office. There was a large brick goods shed with one siding passing through it. Another siding passed in front of a cattle dock which had a small pen at one end, and another siding terminated end-on to the dock. There was also a 5-ton crane in the yard. 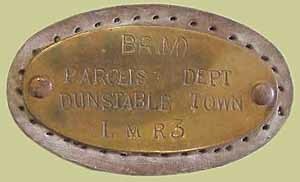 The station was renamed Dunstable Town on 1st January 1927. The goods yard closed on 7th December 1964 although a private siding remained in use after that date. After closure to passengers on 26th April 1965 the station, being largely of timber construction, was quickly demolished as was the three-storey brick building and adjacent house. 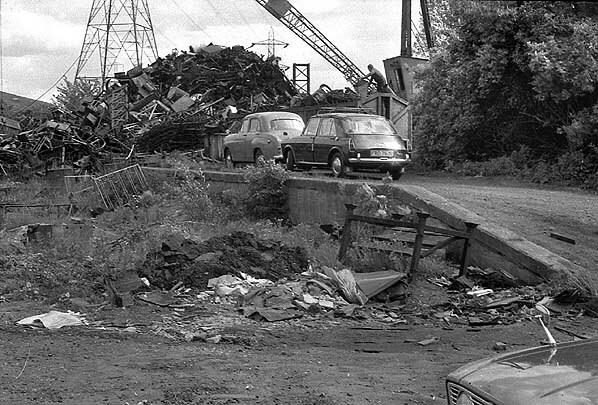 Prior to closure part of the goods yard had been leased to a scrap metal dealer and they stayed on in the yard after closure. The yard was also used for storage of large diameter pipes for oil and gas pipelines. A footbridge was built on the west side of the railway bridge to take pedestrians across the busy A505 (Church Street). By the early 1990s the scrap yard had gone, and in later years the yard was used as a car park until it was redeveloped for housing in 2008.
overgrown. It was finally lifted in autumn 2010 during the construction of the Luton - Dunstable busway which will pass through the station site. The bridge over Church Street was demolished in October 2010.
opposed by a minority of disgruntled Luton shareholders who claimed that passengers would be forced to travel to London via the Eastern Counties main line at Hertford rather than using the shorter GNR route via Hatfield. The amalgamation and formation of the Hertford Luton & Dunstable Railway was passed at a heated meeting on 26th January 1858, but although both lines were completed and approach embankments were constructed, the linking bridge was never built due to restrictions imposed by the GNR. 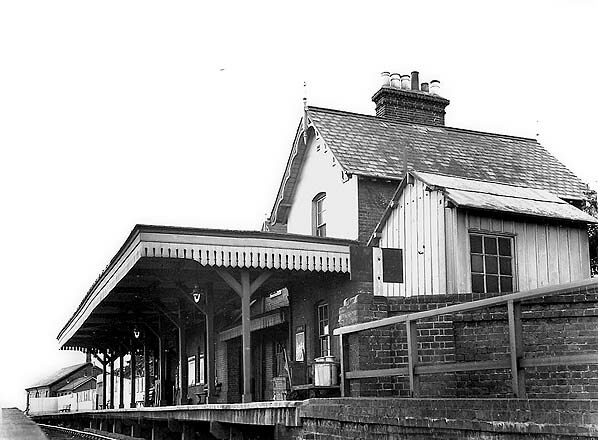 The Hertford line was opened to passenger traffic on 1st March 1858 between Hertford (Cowbridge) and a short-lived station at Welwyn Junction on the GNR. Busway' (previously known as Translink) will link Luton airport and Houghton Regis following the former railway line between Luton and Dunstable and the route of the siding to the Dunstable cement works at Houghton Regis. It opened on 25 September 2013. Dunstable Church Street station looking south east before December 1910. The name Dunstable Church Street can be seen on the signal box. The station wasn't renamed Dunstable Town until 1927. The signal box was opened in November 1880, when the station was rebuilt, and survived until 1934 when it was replaced with a ground frame. The line serving Dunstable cement works is seen to the north of the station. Dunstable Town station looking north west c. 1950s. 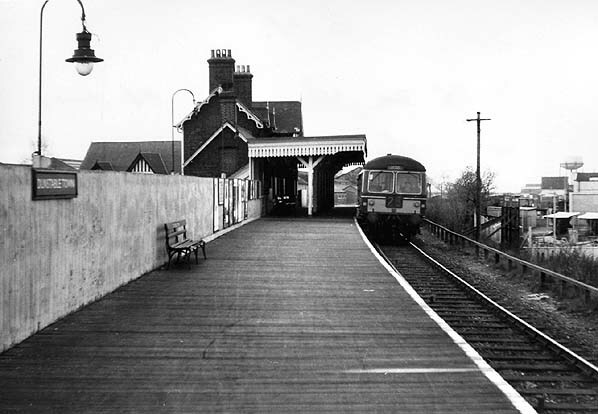 Dunstable Town station in January 1953. The goods shed is seen on the left. 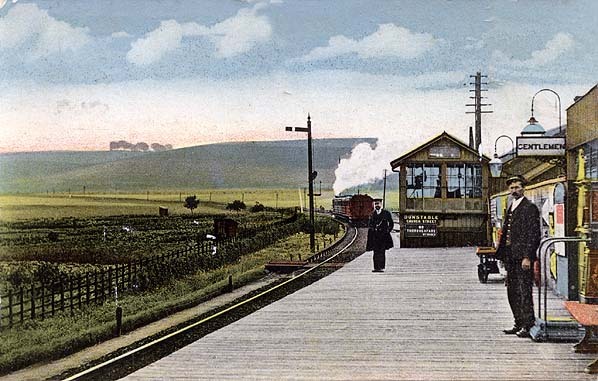 Note the signal box seen in the 1910 picture above has gone. 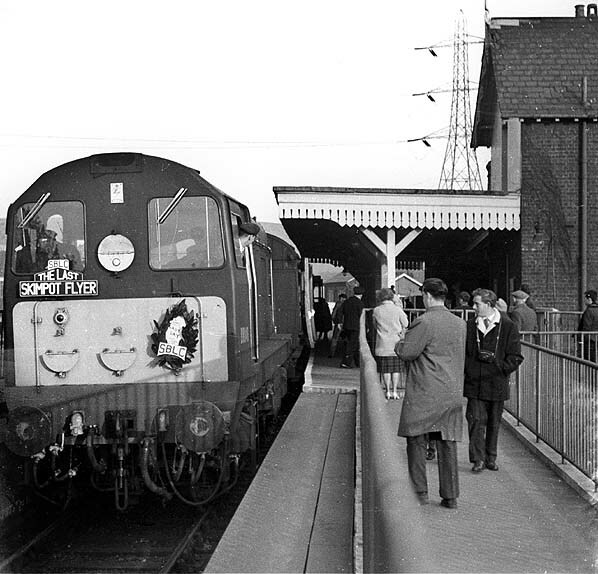 A DMU bound for Welwyn Garden City waits at Dunstable Town station in 1960s. 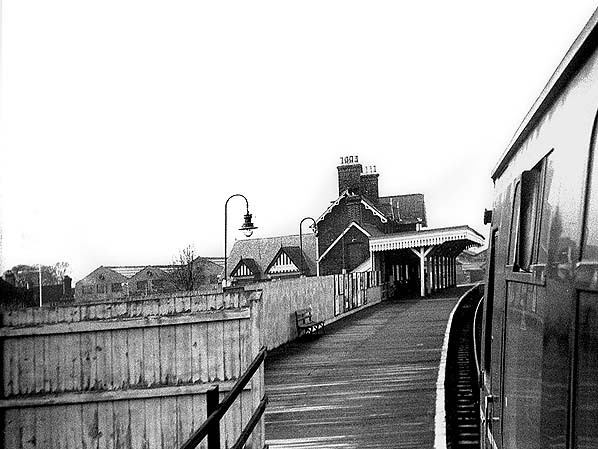 Dunstable Town station seen from a departing eastbound train in April 1965. D8046 calls at Dunstable Town with the 7. 03 p.m. Hatfield to Dunstable North train on 24 April 1965; this was the last 'Skimpot Flyer'. After closure Dunstable Town station was quickly demolished, and the goods yard was leased to a scrap dealer. The cattle dock still survived in June 1975. Looking south east towards Dunstable Town station in April 2006. The station was on the far side of the bridge over Church Street. 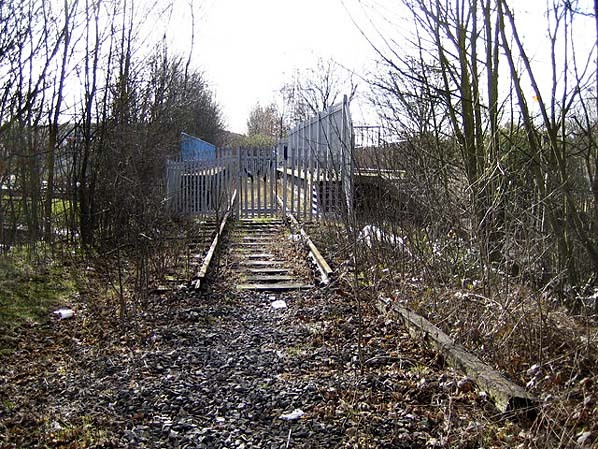 The mothballed track remained in place until autumn 2010. Photo by Nigel Cox from Geograph. Reproduced under creative commons licence. 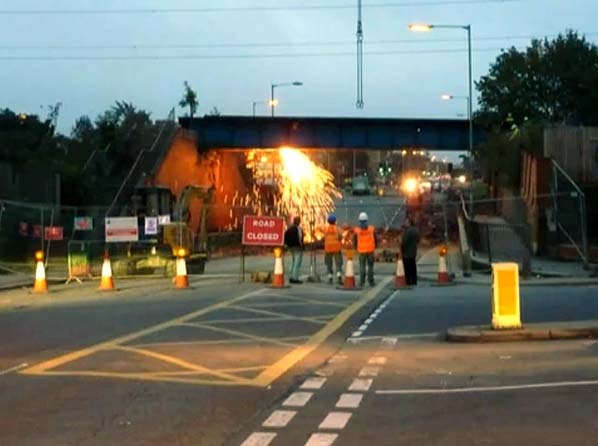 Dunstable Town - demolition of the bridge over Church Street in 2010. 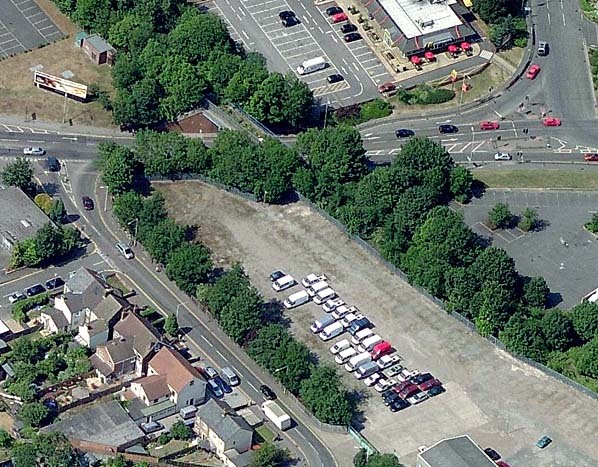 Aerial view of the site of Dunstable Town station c. 2005. The car park occupies the site of the goods yard with the platform on the right side. The overgrown track is still in situ hidden by trees. The bridge over Church Street is seen at the top. Looking south east across Church Street to the site of Dunstable Town station in December 2010. 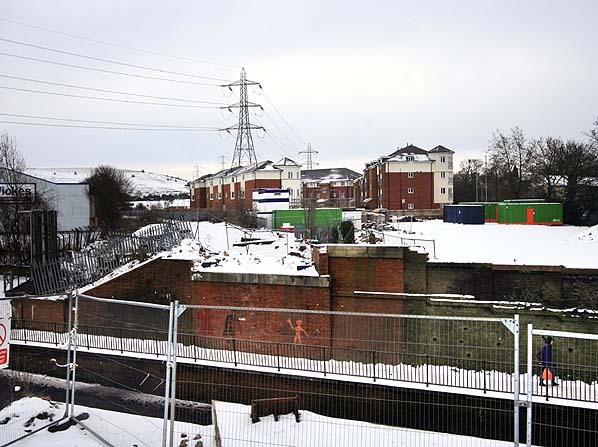 The new housing development (Station Court) was built in 2008 and occupies the south end of the former goods yard. Phase 2 of the development is currently underway with properties expected to be offered for sale in spring 2012. Looking south east across Church Street to the site of Dunstable Town station in July 2013. The new bridge across Church Street has been completed and the guided busway can be seen on the far side of the bridge running through the site of Dunstable Town station. It was due to open in April 2013 but was delayed, eventually opening on 25 September 2013.